There are many non-drug therapies that can help relieve symptoms of restless legs syndrome (RLS). 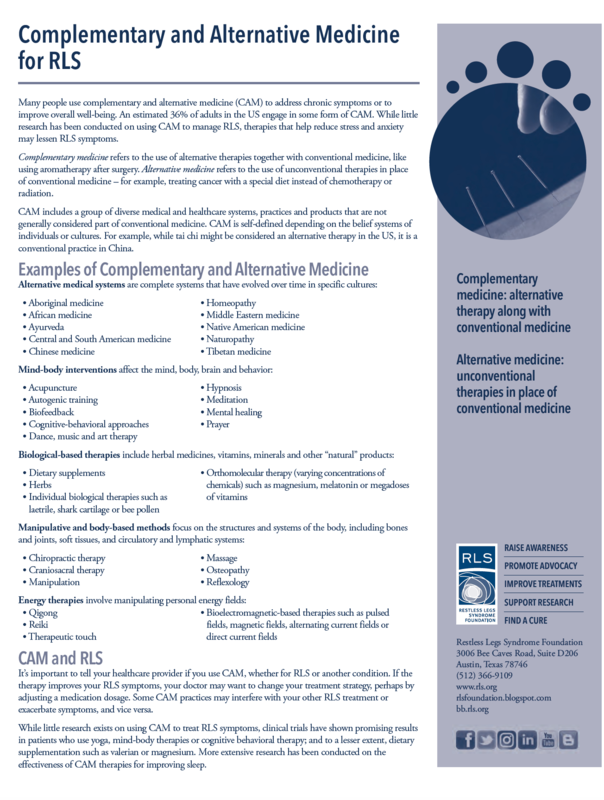 Some people use a nonpharmacologic approach either in place of drug treatment (also known as alternative therapy) or in addition to drug treatment (complementary therapy). Review your diet to ensure it is healthy and balanced. Iron deficiency without anemia has been associated with increased fatigue, depression, cognitive impairment, decreased work capacity, and also RLS. That is why we recommend checking ferritin levels to see if you have an iron deficiency and possibly supplementing your diet with iron. Note: Iron supplements should only be taken under the care and supervision of a physician. You should also identify and avoid habits or factors that may trigger or exacerbate RLS symptoms. 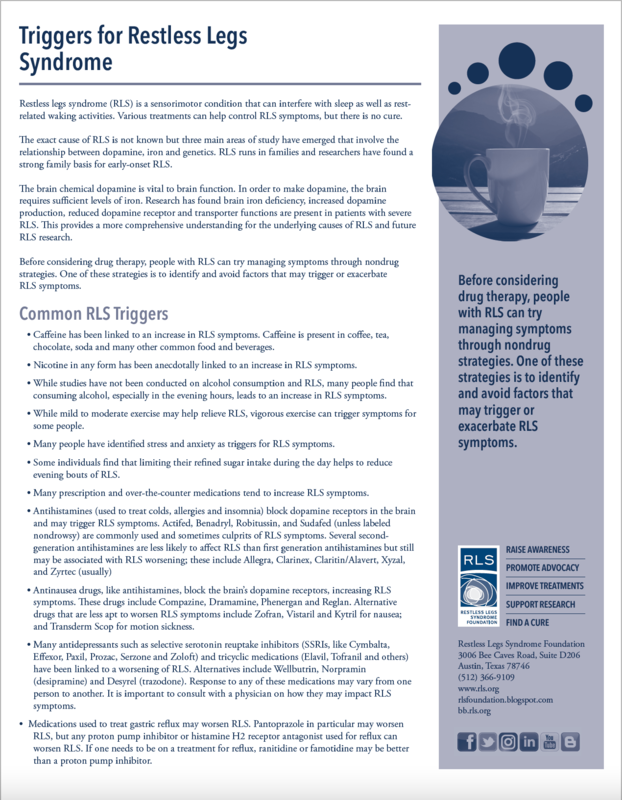 Caffeine has been linked to an increase in RLS symptoms. Many people also find that nicotine, alcohol and refined sugar may lead to an increase in RLS symptoms. For more details on diet considerations, please view the following publications available in the Members Only section of our website. As a member, you receive the latest news on advances and treatments, all while supporting research toward a cure. Become a member today. Inside: Advice on identifying and avoiding common RLS triggers. Inside: An overview of the importance of iron and the relationship with RLS. 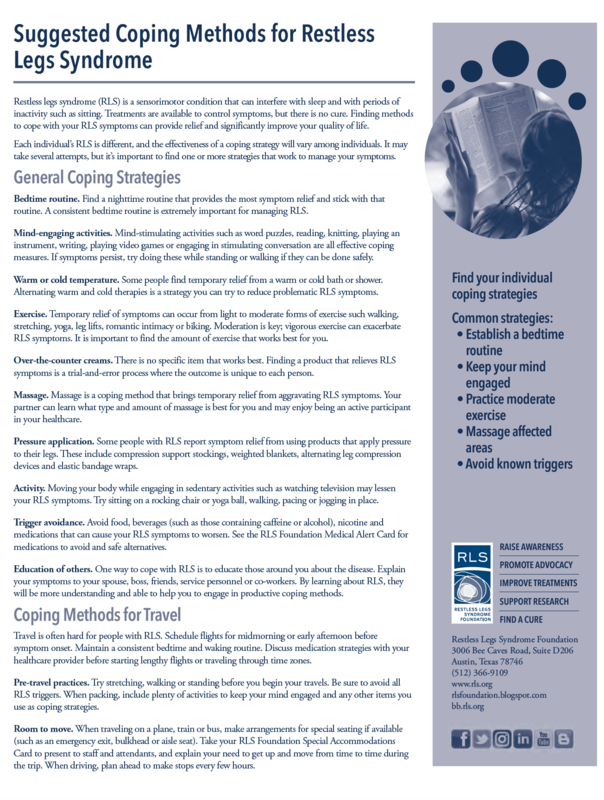 Inside: Tips for coping with common RLS symptoms at home, at work and while traveling. Inside: Find out the alternative options available to help improve your sleep and well-being. Research demonstrates that an active lifestyle can prevent and/or treat RLS. Regular exercisers are 3.3 times less likely to have RLS than non-exercisers. For those individuals living with RLS, one study suggests that regular exercise reduces severity of the symptoms by an average of 40 percent. Daily is best! Make 30-60 minutes of enjoyable, physical activity a daily lifetime habit. Emphasize activities involving the legs, including both aerobic and high-load (resistance) exercise. Exercise in moderation. Avoid exercising to the point that muscles or joints ache or become painful as this will very likely make the RLS symptoms and your sleep worse. Do not engage in any activity or workload that a doctor has told you to avoid. In addition to planned sessions, increase “incidental” activities such as taking the stairs, using easy-to-find, distant parking places, performing physical chores with force and energy, etc. 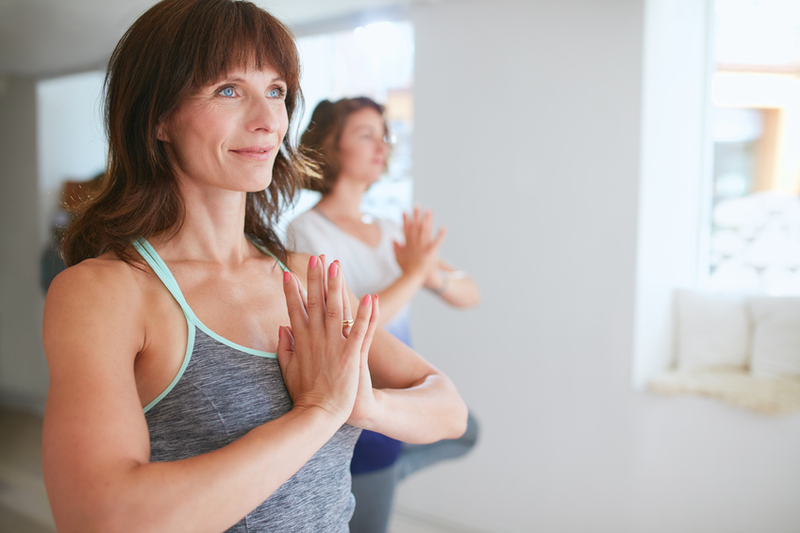 Determine for yourself when to exercise for optimal relief from RLS symptoms. However, avoid significant exertion within an hour or so of bedtime. Become a Foundation Member today to access our Activity, Exercise & RLS handout for more guidelines. As a Foundation Member, you receive the latest news on advances and treatments, all while supporting research toward a cure. Please note: the information provided on these pages is for informational purposes only. It should not be considered a substitute for the advice of a healthcare provider. Inside: Advice on how to incorporate activity into your daily life. If you have RLS, you are not alone. Questions? Please contact us at info@rls.org today.